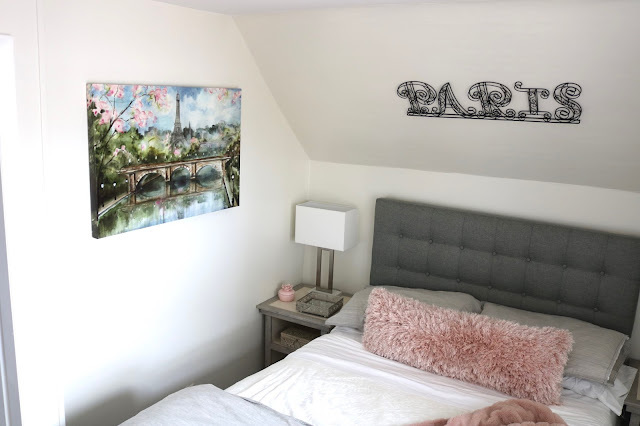 Amy's Creative Pursuits: My New Guest Room Remodel: The Big Reveal! 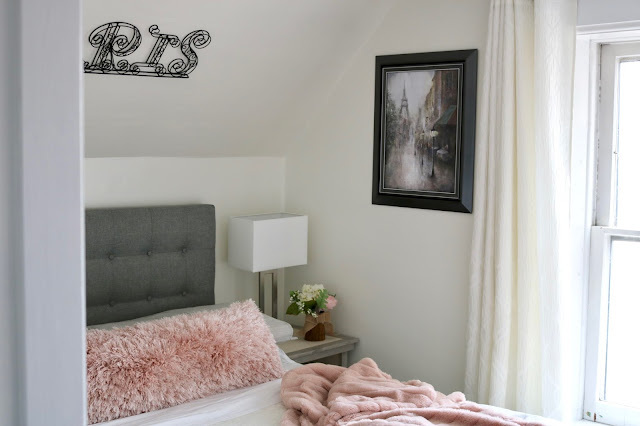 I am so excited to finally be able to show you my newly remodeled guest room. It turned out so beautiful and I couldn't be more pleased. If you missed my earlier posts and would like to see the "Before" and inspiration pictures check out this post HERE. I also did a construction post HERE where my husband did a video explaining how he made a pocket door. Now lets begin the tour of the new guest room. The guest room is located right across the hall from the Master Bedroom. It is a very small room with angled ceilings on each end of the room. One side of the room has two large windows and the other side (opposite of the bed) is a large closet. 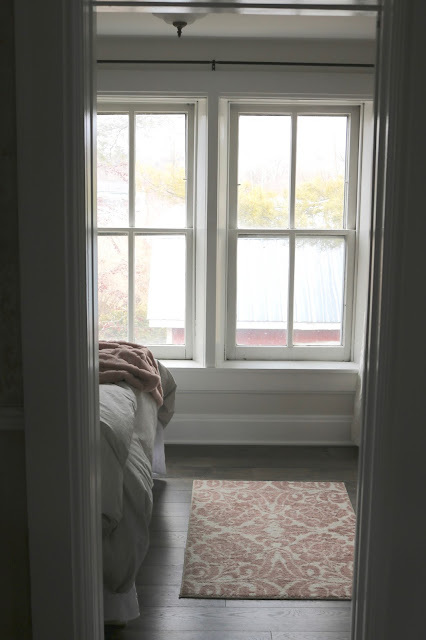 This is the view of the guest room from the Master bedroom. And this is the view of the room if you were standing in the doorway looking to the left. The room used to have a queen bed side ways against the wall. It was very awkward to get in and out of the bed if two people used the bed. It was also quite the challenge to make the bed. To solve that problem we went down from a queen size mattress to a full. We then were able to fit custom made nightstands on either side of the bed. I purchased this simple, upholstered headboard from Wayfair for $100.00. My husband built the platform the mattress sits on. 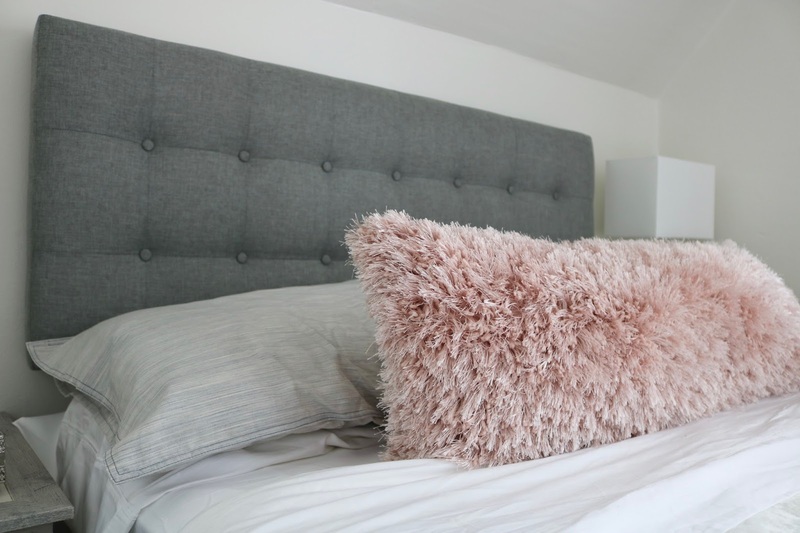 Originally I had intended to buy a white headboard, but when I saw this one it was love at first sight and I changed my mind. I really liked the tweed fabric and how it stood out from the wall color. I was afraid a white headboard would blend in with the wall too much and not make much of a statement. 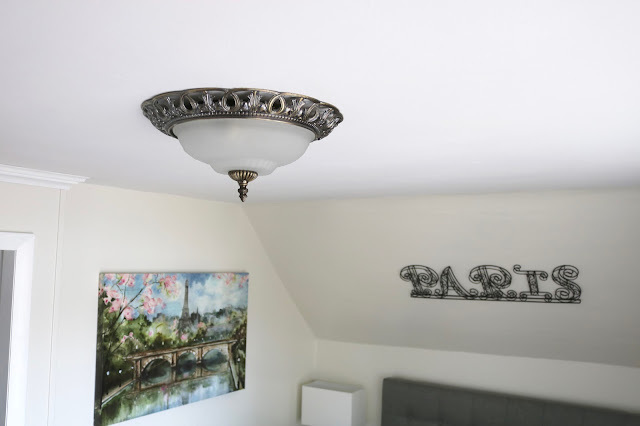 Everything in the room is brand new except the light fixture, the "Paris" metal sign, and one small Paris picture. 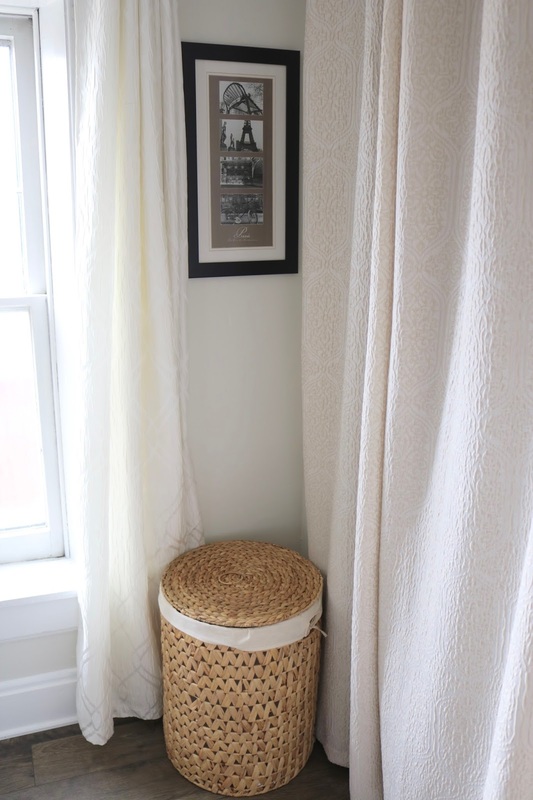 Originally I intended to reuse a lot of the fabrics from the original room, but my husband did not like the toile and wanted me to get rid of it. The light fixture seemed to coordinate well with the metals and colors already in the room, so we did not change it out. 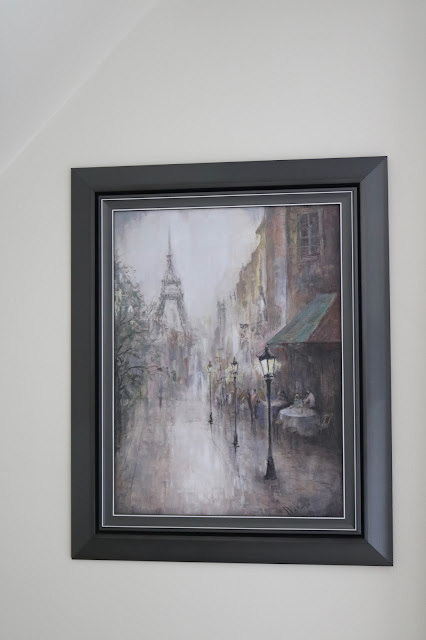 The beautiful Paris picture on the left wall was purchased at Ross for $24.99. I couldn't believe my luck when I found it. It was as if it was made for the room. The colors in the painting could not have coordinated more than if I planned it that way! I picked Millennial Pink as my accent color for the room. The pink pillow and blanket were purchased at Home Goods. We shopped around for night stands but could not find any the size that we needed. 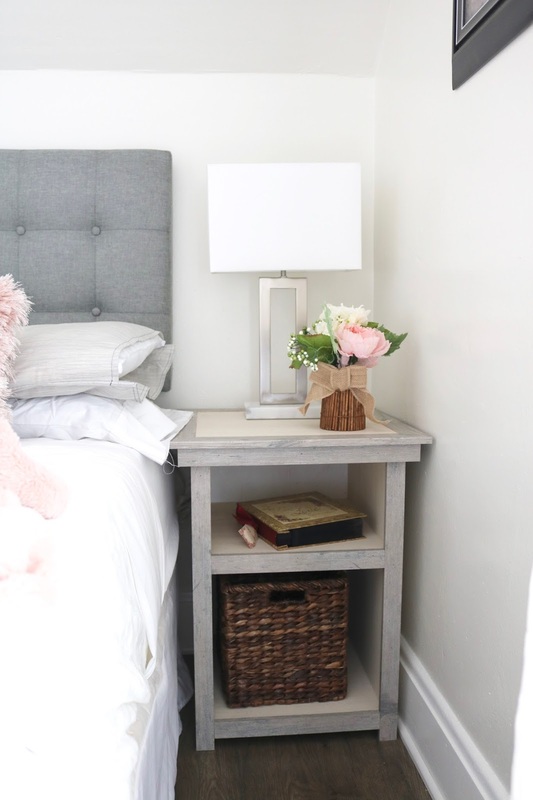 We only had 18 inches to spare on either side of the bed and most nightstands are around 24 inches wide. So my husband came to the rescue and made these out of pre-painted shelving material and trim from a home improvement store. I LOVE the way they turned out, and frankly, they look better than any nightstand I found in the store and for a fraction of the price. I'm so happy I'm married to a carpenter! The night stands are very modern and simple. 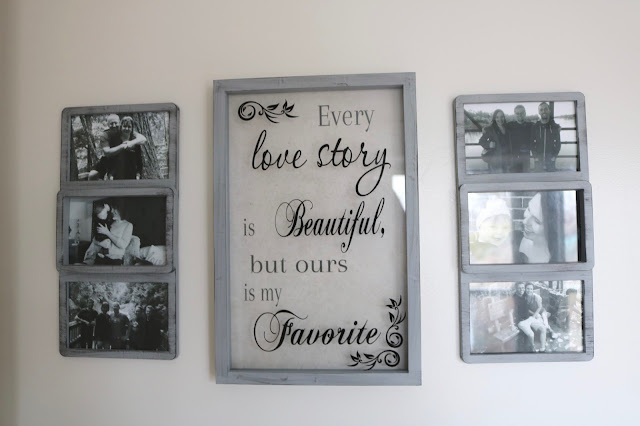 They are made of two different colors of distressed wood: white and grey. I placed a lamp on each nightstand and different nick-knacks on each one. 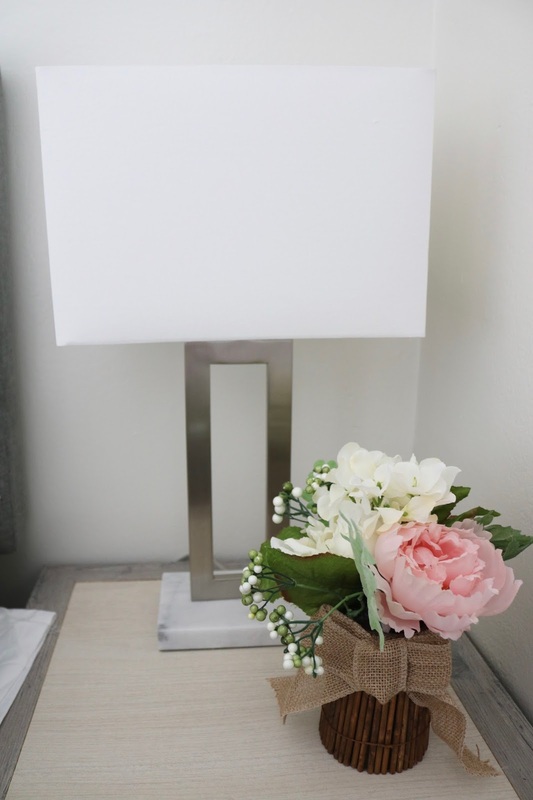 For the right night stand I added a floral bouquet of white and pink roses, a basket, and a photo album containing pictures of my daughter's wedding. The light fixtures took the longest to find. The size had to be "just right" because of the narrow space and the angled ceilings. I searched for weeks and finally found these modern light fixtures with rectangular shades at Target. The flower arrangement believe it or not, I found at Walmart for $4.99. 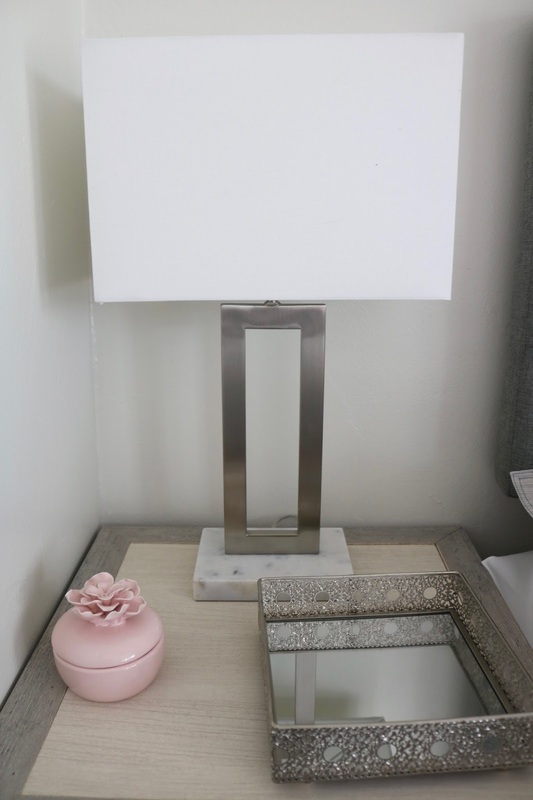 On the other night stand I placed a mirror tray and a pink jar. On the lower shelves of this night stand sits a pretty wooden box and a white elephant. To the right of the bed another Paris-themed picture hangs. The pinks and greys in the picture pull out the colors in the bed. This is the view if you were sitting in the bed. The windows are to your left, the closet is straight ahead, and the pocket door is to your right. I already had the drapery hardware in storage; I bought them years ago for another project, but never used them. They ended up being perfect for this room as the black iron matched the black iron in the "Paris" sign and in the light fixture. The drapes are all new. 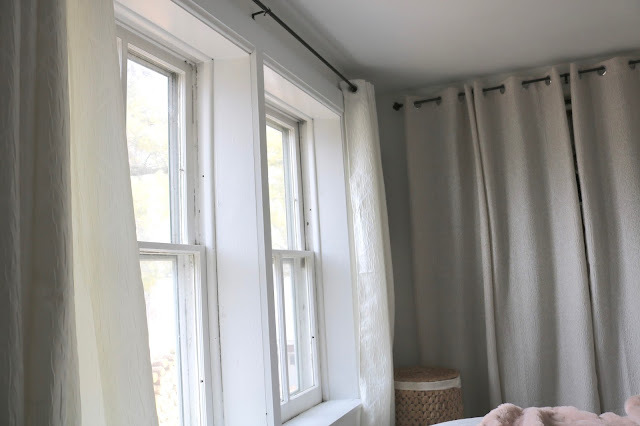 I couldn't find eight drapery panels exactly the same at the discount home stores I shop at; so I purchased four of two different kinds of drapes: one set for the window and one set for the closet. These are the window drapes. 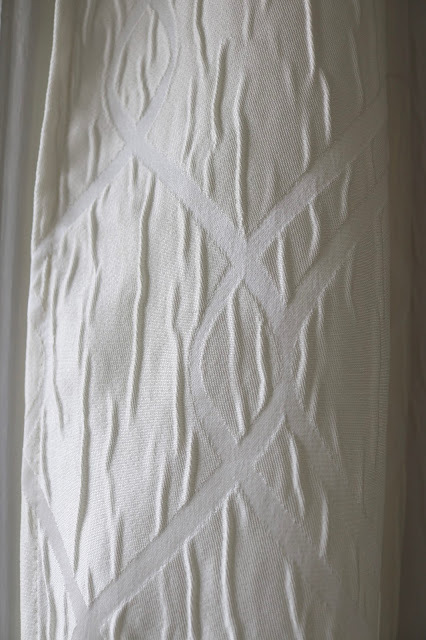 They are a crinkled ivory with a scroll pattern. 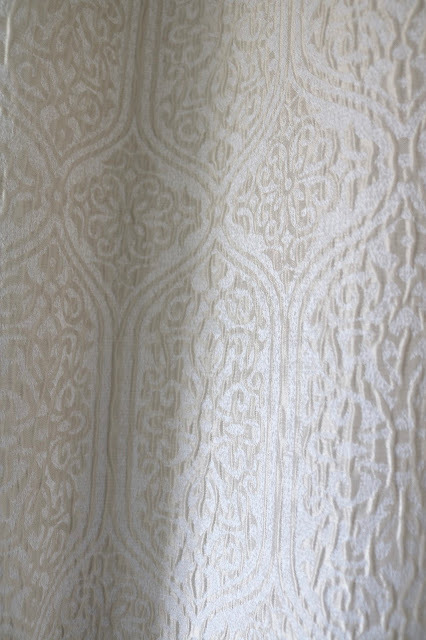 These are the closet drapes. They are also an ivory, but have a off-white/slightly beige print on them. My husband and I were shopping and I spotted this photo frame set on clearance for only $9.00. I instantly fell in love with the quote and I knew it would be perfect for the new room. The distressed grey paint on the frame matched the distressed grey paint on the nightstands. I printed out some of my favorite family photos in black and white to go inside the frames. I love the personal touch this added to the room. 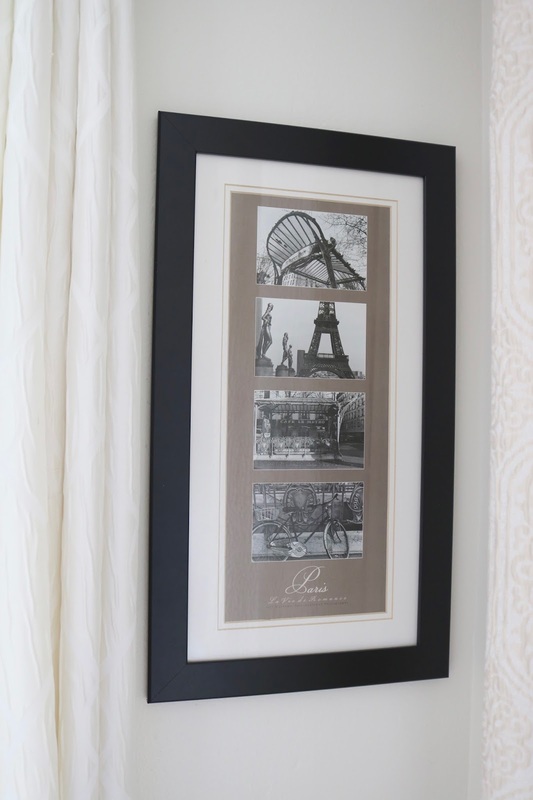 On the opposite side of the room is a wicker laundry basket for my guests to use and another Paris -themed picture. This picture was in the original room and matched the new room perfectly so I kept it. 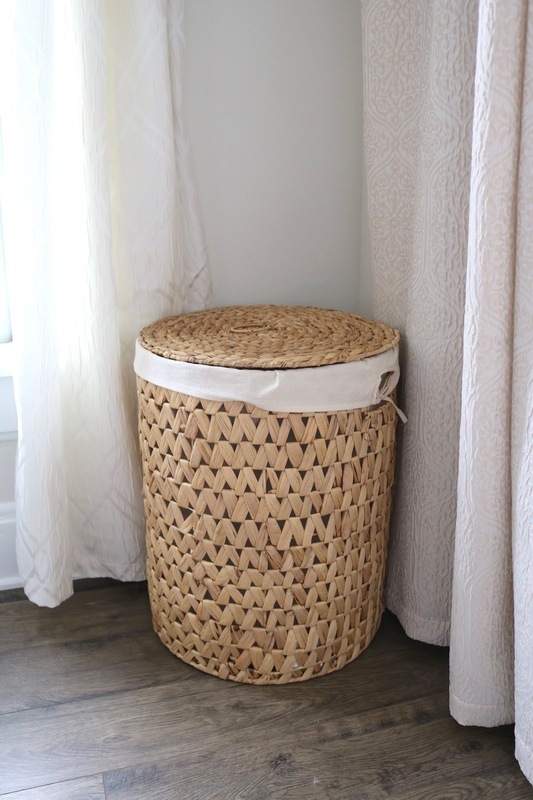 I picked up the laundry basket at Home Goods for $24.99. Jackson has jumped on top of it twice now and collapsed the lid inside the basket, falling inside. He gets so scared when he falls in. He's so funny! 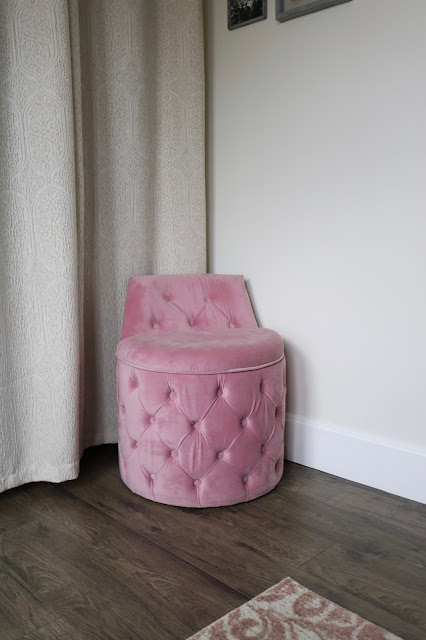 On the other side of the room is this upholstered stool. It opens up and hold shoes. Unfortunately Jackson knew it opened and put bite marks all over it within 24 hours of bringing it into the house. He wanted to open it so he could jump inside. Oh, the joys of having pets! I didn't want to cover up our new beautiful floor with a large rug, so I added this small one right at the foot of the bed. We could have fit a small dresser on the pocket wall door, but wanted to leave as much floor space in the room as possible for a crib. Wow! That's a lot of money. If you would have told me when I started I'd end up spending that much money on a remodel I would have said you were crazy. It ended up costing this much because of flooring and getting a new bed. When we decided to turn the mattress and go from a queen to a full I not only had to buy a new mattress and headboard, but I had to buy all new bedding: two sets of sheets, a mattress cover, duvet cover, blanket, bed skirt, throw, pillow, and a coverlet for the summer months. It really added up! Everything in the room was purchased at discount stores like HomeGoods, TJMaxx, Ross, Menards, and Target. Finally, here is a video of me walking you through the entire room explaining everything in fuller detail. Even though the room ended up costing me a lot more that I originally planned, I am absolutely thrilled with it! I can't believe the transformation from the dark, gloomy room it was before to the light, happy place is it now. I love waking up in the morning and seeing this gorgeous room across the hall. It seems so much more spacious to me now just from adding a pocket door and painting it a lighter color. It's also Jackson's favorite room now. He is always napping on the Millennial Pink blanket or snuggling against the fluffy pink pillow! He has great taste, what can I say? Love everything about this room and was glad that I got in on some of the shopping for the room! Thanks Sandy! I'm happy you were willing to stop at HomeGoods with me so I could pick up the finishing pieces. 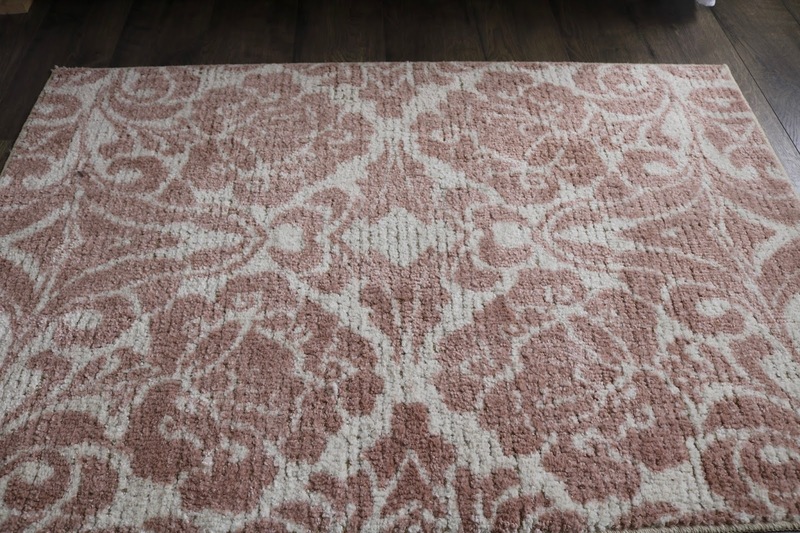 I love the rug you helped me decide on. I can't wait till the Eau Claire HomeGoods opens. They are going to make a lot of $$$$ out of me! Thanks Ellie! That Paris picture is so gorgeous! I wish Ross had a website so I could link to it. I would check your local Ross store...you never know, you might find it. 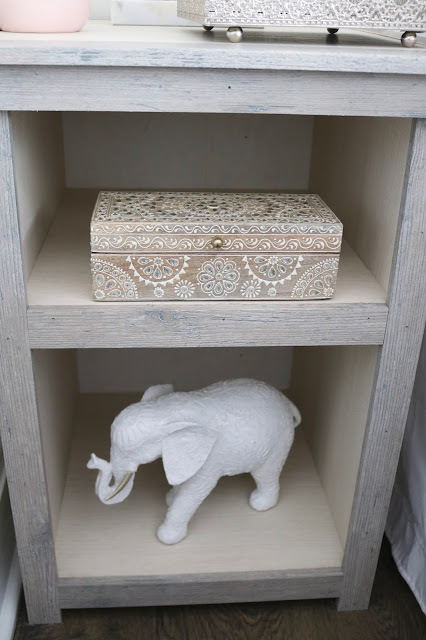 I found the elephant statue and wooden box at a Ross in Wheaton, Illinois and when I came home to Eau Claire, Wisconsin they had them too! Oh Amy, how I have waited excitedly for this post! 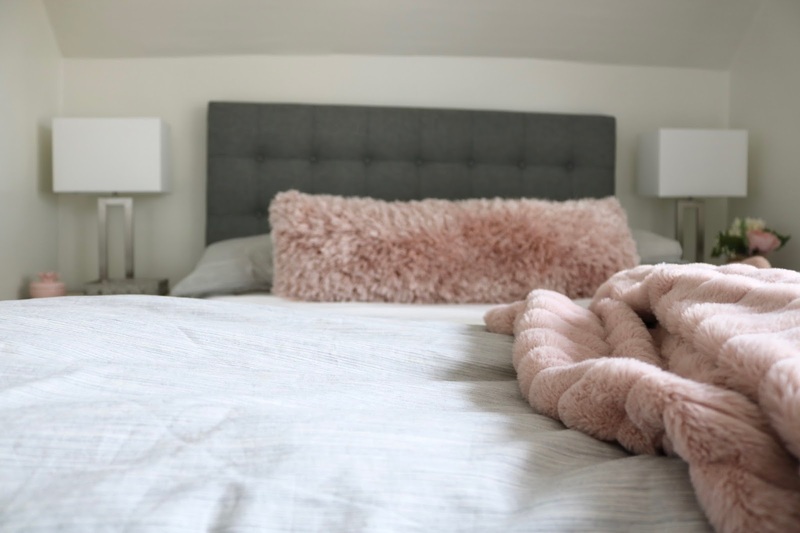 The room is gorgeous and calm, just like YOU! You and hubby have done an amazing job. That pocket door, those bespoke nightstands, truly transforming. Loved the video, thanks to you both for making it. And LOVED the shoes you're wearing!!! The guest room looks so pretty! Jackson has excellent taste! Love this remake. So much lighter and more feminine than the 'before' look. 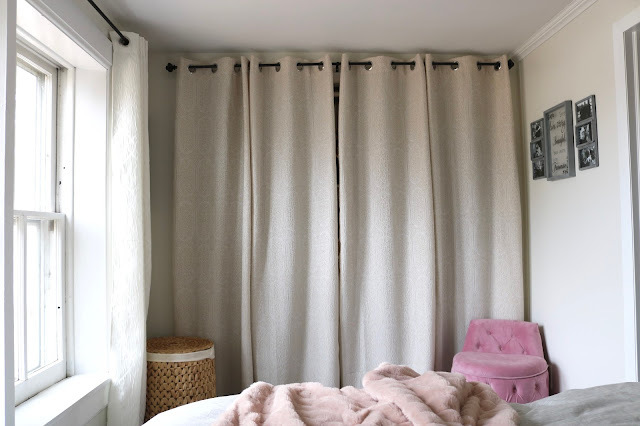 That little rug is adorable and all of the pink accessories are so sweet. I am just home from too many trips out of town and sure could relate to your Insta photo of Jackson on your suitcase. My kitties always know when the suitcases come out, it's bye bye time for mom! I have a gal who watches my kitties so they get to stay at home but I miss them and they miss me when we are apart. Give Jackson a snuggle for me. Thank you! Yes, I love the lighter look. I wish I could leave Jackson at home and have someone watch him. I just don't know anyone. 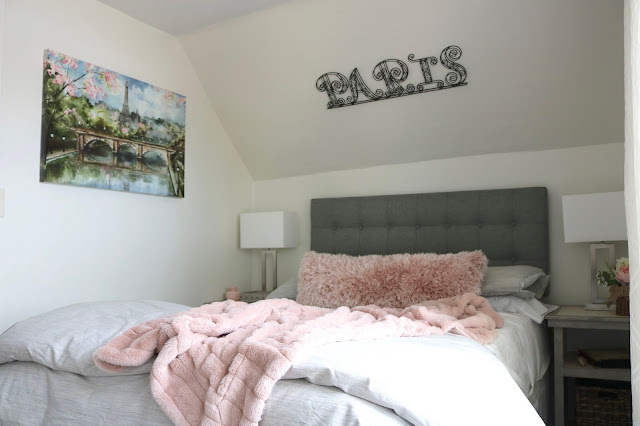 Very pretty room redo! Your husband's nightstands are really nice! I like your other style choices too. Beautiful job! I love the big pink pillow! Love the finished results! The pink accents look so pretty against the sophisticated grey palette. I can see why Jackson wants to stake his claim! You did a fabulous job with this space. Beautiful. I love the wall color. Very nice that you have such big windows in there too. You did a great job. I am thinking of doing our guest bedroom..we would need the new bed and mattress too. That sure is costly.